1. Season thighs with salt and pepper. Melt coconut oil or ghee in large sauté pan over medium-high heat. Add orange wedges to pan. 2. Add chicken to pan and sprinkle rosemary over the chicken. Brown chicken on both sides and cook through, about 4-5 minutes per side. 3. 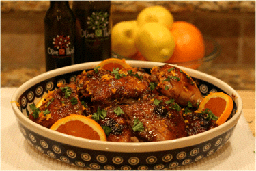 Remove chicken from pan and add balsamic vinegar to deglaze. It might be a wise idea to have the vent fan on or a window cracked during this step. 4. Scrape up browned bits off the bottom of the pan and then mix in marmalade/orange spread. 5. Add chicken back to pan to coat and serve. 6. Garnish with fresh chopped rosemary if desire and enjoy!